United Kingdom, April 11, 2013. The Truvia® business announced today that the UK sweetener market has grown by £3.5m in 2012 – a 7 percent growth rate in a previously flat market. This growth is primarily due to the introduction of stevia-based sweeteners, which, since their introduction to the UK market in January 2012, have been responsible for 80 percent of this £3.5m growth. Truvia® sweetener is the leading stevia-based sweetener of the stevia market, representing £1.7m in its first year (source: Nielsen Scantrack). Over 396,000 UK households have purchased Truvia® sweetener in the past year. Recent new product development initiatives of Truvia® calorie-free sweetener tablets and Truvia® Baking Blend are set to further accelerate the growth of the category. As an ingredient, Truvia® stevia leaf extract is used in over 50 foods and beverages worldwide, including recently introduced Coca-Cola’s Sprite® and Glaceau’s vitaminwater™ in the UK. Truvia® calorie-free sweetener, which is distributed in the UK by Silver Spoon, is the leading global, great-tasting, stevia-based sweetener. It first launched in 2008 in the US, where it is now the number two sugar substitute and has grown the category by over 20 percent. Following a year of successful growth across Europe and North America, the Truvia® business recently announced its entry into the South American market with a launch in Venezuela. Truvia® consumer products will soon be available for purchase throughout North America (United States, Canada and Mexico) in addition to the United Kingdom, France, Italy, Spain, and Venezuela. Following this successful first year in market, Truvia® calorie-free sweetener kicked off 2013 with a new £5 million integrated marketing campaign to drive trial and educate consumers about this exciting alternative to artificial sweeteners and sugar. This year also sees the launch of two new product formats, Truvia® calorie-free sweetener tablets and Truvia® Baking Blend in the UK. New Truvia® sweetener tablets are perfect for consumers seeking a convenient, calorie-free alternative to sugar or artificial sweeteners. Each tablet provides the same sweetness as one teaspoon of sugar. The product will be sold in packs of 100 tablets, available in Waitrose and Sainsbury’s since February 2013 and Asda from March 2013. Truvia® Baking Blend offers home bakers an easy way to control calories. This blend of Truvia® calorie-free sweetener and Silver Spoon sugar provides 75 percent fewer calories per serving than sugar. It bakes and browns like sugar for delicious, lower calorie cakes, brownies and cookies. Truvia® Baking Blend will be available in 500g packs in Waitrose and Sainsbury’s from February 2013. 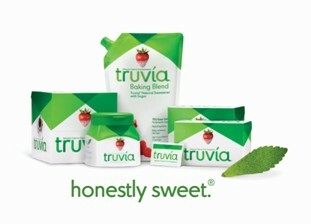 Truvia® sweetener is a great tasting, zero-calorie sweetener made with the best tasting part of the stevia leaf. Truvia® sweetener is #1 in its category of zero-calorie natural sweeteners in the U.S., the U.K and Venezuela and is available to consumers in Europe and North America. Truvia® stevia leaf extract is also a versatile sweetening ingredient used to reduce calories and sugar in foods and beverages. The Truvia® business uniquely manages its stevia supply chain from Field to Table having established a global agricultural standard for stevia. For more information, visit www.truvia.co.uk. Cargill is an international producer and marketer of food, agricultural, financial and industrial products and services. Founded in 1865, the privately held company employs 142,000 people in 65 countries. Cargill helps customers succeed through collaboration and innovation, and is committed to applying its global knowledge and experience to help meet economic, environmental and social challenges wherever it does business. For more information, visit Cargill.com and its news center. The Silver Spoon Company is part of Associated British Foods, a diversified international food, ingredients and retail group with sales of £11.1 billion across 46 countries worldwide. The Silver Spoon Company comprises of a portfolio of leading UK brands including Allinson, Askeys, BakingMad.com, Billington’s, Crusha, Silver Spoon and Silver Spoon Create. The Silver Spoon Company also partners as exclusive distributors for Nielsen-Massey Vanillas and Truvia® Sweetener. For more information visit www.silverspoon.co.uk or visit the Silver Spoon Company’s mouth wateringly helpful website that offers everything you want to know about home baking, www.bakingmad.com. © 2019 Cargill, Incorporated. All Rights Reserved.